The best thing about going to the Co-op Bank Crisis: Ways Foward for the Co-operative Movement conference organised by Co-operative Business Consultants was getting introduced to Rory Ridley-Duff by Mark Simmonds as someone else who is interested in multi-stakeholder co-ops. I’ve since met with and spoke with Rory quite a few times now, learning all I can about the FairShares model I mentioned in my piece about Open Co-ops for Stir Magazine. Promoting socialised and democratic ownership, governance and management by primary stakeholders. Central to the brand is the FairShares approach to power and wealth sharing through organisation design and intellectual property management. recognise creators and providers of financial capital and enfranchise them through Investor Shares. prevent the transfer of IP ownership from members to the Company or Co-op Society except where this is the express wish of the IP creator(s). In this article, FairShares Association co-founder Rory Ridley-Duff outlines the continuing case for social and economic reform to support a FairShares Model of enterprise. FairShares brand principles change the way that investment activity is understood to ensure that capital is allocated for entrepreneurial, labour and user activities as well as financial contributions. The result is wealth and power that is shared more fairly. At the start of 2014, I came across new studies that acted as a powerful reminder of the need for a FairShares Model. In this article I will describe the most striking of these, then argue that the co?operative and social enterprise movements need to concern themselves with everyone in the ‘bottom’ 80% of the population, not just those in extreme poverty. They also need to protect the wealth embedded in our natural environment. I recently came across a YouTube animation that portrays private wealth distribution in the US using data from a study at Harvard University. This tells a completely different story to Shift Change, a documentary about social economy in the US and Spain. While the Harvard study reports that top US CEOs get380 times the average worker’s pay, Shift Change reports that worker co-operatives either adopt equal pay systems or accept small wage differentials sanctioned by the worker-owners. For example, the ratio between top and lowest paid workers in the Mondragon Co-ops – where there are 100,000 workers – averages just 5:1 . The Harvard study claims that 90% of citizens are impoverished by private sector business practices. The ‘bottom’ 80% owns just 7% of total wealth, while the top 20% has 93%. Only 10% gain, and the top 1% gain disproportionately. There is no doubt. Hayek’s theory that economic freedom leads to a ‘trickle down’ effect is untrue. It produces a ‘trickle up’ effect instead  . But Shift Change shows that where co?operative business models become dominant, wealth is spread more evenly and equitably. Member-owned businesses more often than not, are as (commercially) successful as their private sector counterparts  . That’s where the FairShares Model comes in – it stimulates change to support growth in the social economy. Most social enterprises focus on the poorest communities. Whilst important, it is more urgent that we reform systems that exploit and impoverish up to 90% of working people (as well as the environment in which they live). We need social enterprises for the bottom 90% (everyone impoverished) not just the bottom 10% (the most impoverished). We also need a way to prevent the top 10% of earners acquiring hegemonic control over investment decisions. If this task is beyond us, the goals of social enterprise will also be beyond us. It is not an accident that most people are getting poorer (in both absolute and relative terms). Studies of company law make it clear than private enterprises are not designed to share power or wealth . Founders fix structures at incorporation to privilege a set of interests (i.e. entrepreneur(s) and financial investors in companies, consumers or workers in single stakeholder co-operatives). Charitable organisations are also inflexible: board and workforce members are subordinate to charitable/social objects set by the founders. Entrepreneurship research clarifies how enterprises start. One or more founding members – by design or accident – find opportunities to develop new markets for products and services . If viable, they organise resources to support a business and build socio-technical systems to maintain management control. Growing enterprises, however, also depend on the goodwill of the workforce, customers (service users) and institutional investors to access the human, social and financial capital needed for sustainability . The key issue is that while we have developed systems for recognising the contribution of financial capital, we do not have adequate arrangements for recognising contributions of intellectual, human, social and natural capital. To understand why, we have to review the way social norms for constituting joint-stock companies and non-share companies have developed. There is a connection between business ideology and the arrangements in law by which entrepreneurs acquire share capital (ordinary shares). They register as directors, then recruit employees to operationalize their ideas. 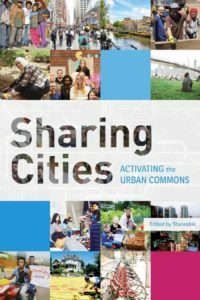 New capital is issued when more financial capital is needed, but not when more intellectual, human, social or natural capital are needed. In an unadapted CLS, employees and customers are subordinated to the interests of shareholders. They are not invited to be full members or to contribute towards decisions outside their specialist area of expertise . If employees are offered share capital, voting rights are often limited or controlled by trustees who – in many cases – are under no legal obligation to vote in accordance with the wishes of their beneficiaries . The intellectual property created by the workforce is acquired by the Company and controlled by executive managers and directors. In effect, majority shareholders treat intellectual, human, social and natural capital investments by others as if they were additional financial investments by themselves. They continue to acquire rights to all the property created by the interactions between employees, customers and the natural environment. This system of enterprise widens the wealth gap between those who own and govern the enterprise, and those who sell their labour to it, or buy goods from it. Even in the richest countries, wealth inequalities grow wider (unless the state intervenes)  and the natural environment is degraded . A typical response to the social problems created by privately owned economies is to create (private) charities and ‘non-profit’ companies using a Company Limited by Guarantee (CLG). This form of incorporation usually involves specifying charitable or social objects that define the purpose(s) of the enterprise. Founders reframe themselves as trustee-directors responsible for allocating resources in pursuit of social goals. Charitable CLGs do not issue share capital so trustee-directors give up personal rights to the surplus wealth created by the enterprise. Their role (in law) is one of stewardship, ensuring that funds raised are used to further charitable (or social) objectives defined in the Articles of Association. As in a CLS, they employ staff to pursue social goals. Employees are still not (usually) legal members. They continue to be subordinate to the trustee-directors and give up the (intellectual) property they create. Do we have to choose between these two models? Three bodies of knowledge suggest we do not. Firstly, there is a global movement backed by the UN to increase responsible use of corporate assets . Secondly, the UN’s International Year of Co-operatives highlighted the global growth of the social economy . Particularly important is the way that the internet has reduced the costs associated with co-operative working. The upsides of co-operation (intellectual exchange and collaborative decision-making) no longer come with the downsides of democracy (hefty co-ordination costs) . Lastly, more enterprises identify themselves as social, deploying business models that improve human well-being through innovative trading strategies . Creating non-shareholding companies enables the wealthier sections of society to address some symptoms of poverty and exclusion that private enterprises create, but it cannot address the root causes because it changes neither the ownership structure nor governance processes that creates and sustains them. Traditional private / non-profit models continue to institutionalise a division between producers and consumers on the one hand, and entrepreneurs and (social) investors on the other. For this reason, Level 1 of the FairShares Model asks important questions about representation in ownership, governance and management. As shown above, the FairShares Model is based on an approach to social economy defined by Social Enterprise Europe. It operates from the assumption that the exclusion of primary stakeholders from member-ownership (i.e. employees, producers, customers and service users) is a cause of contemporary poverty. At Level 2, the answer to each FairShares question suggests the set of corporate arrangements that is most favourable: entrepreneurs get Founder Shares; workforce members get Labour Shares; trading commitments are rewarded with User Shares; and financial capital creation is rewarded with Investor Shares. This represents a new approach to valuing investments. When there are surpluses (profits), not only do the providers of financial capital get a return, but also the contributors of other types of capital. In a FairShares Company, half the capital gain is issued to Labour and User Shareholders as new Investor Shares,while the other half increases the value of existing Investor Shares. In a FairShares Co-operative, surpluses can be allocated to restricted funds controlled by Labour and User member-owners, who then use their chosen approach to direct democracy to allocate surpluses to social investment projects. None of this means that the conventional mechanism for allocating shares to external financial investors has to stop. In a FairShares Company / Co-operative, Investor Shares can be issued to external investors if debt finance is hard to secure. But, even with this, at least 70% of the wealth accumulated will find its way into the hands (and bank balances) of producers and consumers. It enriches the ‘bottom’ 90% as much as the ‘top’ 10%. And if this is not sufficient, FairShares Articles of Association (at Level 3) includes community dividends that act as an asset lock for philanthropic capital if the enterprise is dissolved. The Articles of Association provided by the FairShares Association are not the only model rules that support FairShares brand principles . But they do represent an ambitious attempt to bring together the most enduring developments in multi?stakeholder ownership, governance and management so that we change the way investments are recognised and valued  . 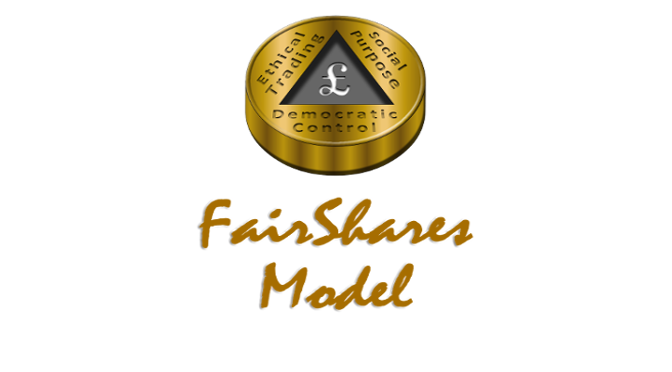 The FairShares Model offers a system for ensuring that capital is allocated to different types of contribution so that wealth and power can be more fairly shared. Dr Rory Ridley-Duff is Reader of Co-operative and Social Enterprise at Sheffield Hallam University (www.shu.ac.uk/sbs), director of Social Enterprise Europe (www.socialenterpriseeurope.co.uk), and a co-founder of the FairShares Association (www.fairshares.coop). 1. Norton, M. and Ariely, D. (2011), “Building a Better America – a Wealth Quintile at a Time”, Perspectives on Psychological Science, 6(1): 9 – 12. 2. Young, C. and Dworkin, M. (2013) Shift Change, Moving Images, www.shiftchange.org. 3. Melman, S. (2001) After Capitalism: From Managerialism to Workplace Democracy, New York: Alfred Knopf. 4. Erdal, D. (2011) Beyond the Corporation: Humanity Working, London: The Bodley Head. 5. Hayek, F. (1960) The Constitution of Liberty, London: Routledge and Kegan Paul. 6. Hayek, F. (1976) Law, Legislation and Liberty: the Mirage of Social Justice, London: Routledge and Kegan Paul. 8. Birchall, J. (2009) People-Centred Businesses, Basingstoke: Palgrave Macmillan. 9. Davies, P. (2002) Introduction to Company Law, Oxford: Oxford University Press. 10. Chell, E. (2007) “Social enterprise and entrepreneurship: towards a convergent theory of the entrepreneurial process”, International Small Business Journal, 25 (1): 5-26. 11. Coule, T. (2008) Sustainability in Voluntary Organisations: Exploring the Dynamics of Organisational Strategy, unpublished Thesis, Sheffield Hallam University. 12. Erdal, D. (2011) Beyond the Corporation: Humanity Working, London: The Body Head. 13. Rodrick, S. (2005) Leveraged ESOPs and Employee Buyouts, Oakland, CA: The National Center for Employee Ownership. 14. Wilkinson, R. and Pickett, K. (2010) The Spirit Level: Why Equality is Better for Everyone, London: Penguin. 15. Hawken, P. (2010) The Ecology of Commerce: a Declaration of Sustainability, New York: Harper Paperbacks. 16. Laasch, O. and Conway, R. (2014) Principles of Responsible Management, Cengage. 17. ICA/Euricse (2013) The World Co-operative Monitor, International Co-operative Alliance / Euricse, access at:https://www.euricse.eu/en/WorldCooperativeMonitor/Report2013. 18. Murray, R. (2011) Co-operation in the Age of Google, Manchester: Co-operatives UK, access at: https://www.uk.coop/ageofgoogle. 19. Ridley-Duff, R. and Bull, M. (2011) Understanding Social Enterprise: Theory and Practice, London Sage Publications. 20. See https://www.socentstructures.org.uk/, a new joint venture by Social Enterprise Europe and NESEP. 21. Westall, A. (2001) Value-Led, Market-Driven: Social Enterprise Solutions to Public Policy Goals, London: IPPR. 22. Ridley-Duff, R. J. (2012) “New Frontiers in Democratic Self-Management”, in McDonall, D. and MacKnight, E. (eds), The Co?operative Model in Practice,Glasgow: Co-operative Education Trust Scotland, pp. 99 – 117.